Snakes are fascinating and a great source of providing entertainment to the public. They also posses power of curing various diseases. However, snakes are obviously not the right pets for everyone except those who are expert in handling them. They have unique requirements and can only be kept by those who are passionate and adventurous besides having the commitment of understanding and meeting their needs. Man’s fear of snakes has ancient evolutionary origins. They usually don’t harm or bite men unless disturbed. There are hundreds of types of snakes found all over the world while only few among them are poisonous. The poison from these snakes can kill man in case of a bite but despite its fright, there are some people who love to keep them and play with them while utilizing them for the purpose of earning money. Muhammad Yasin, 19 a young snake-keeper, lives in Khanna Pul Rawalpindi, who earns money by entertaining people in the streets of the twin-cities while supplicating his family. He basically belongs to Gujranwala. “It has been 15 years that we shifted to Rawalpindi to lead an easy and comfortable life. I used to earn handsome amount of money daily and my household condition were fairly well but now modernity has changed the public interest which has also affected my work,” he explained. “I have been keeping snakes since childhood because it is my passion. My forefathers used to have the same business and now I have started it” He said that he roams and wanders around the city while putting the snake called “anaconda” (Ajdaha)around his neck to entertain people. He also puts the snake on others people’s neck to give pleasure and merriment to them. And then people give some amount of money to him quite readily. “I do not have any job except being a snake-keeper. I earn almost Rs100-150 per day hardly because I go round the city. The snake which I got with me in my box is still of 7 months. He does not bite because he has got no poison in him despite he has not got any teeth,” he shared this while talking to INFN. He said that he feeds ‘Ojhri’ (animal stomach) to the snake. He has to buy a small ‘Ojhri’ within one week for the snake. 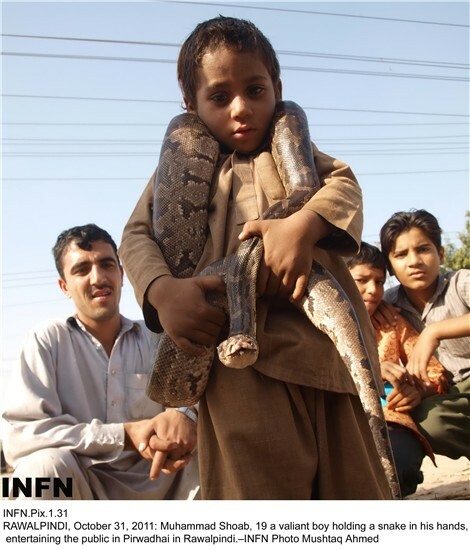 Muhammad Shoaib, 9 is his younger brother who also roams with him in the city while carrying a snake aroung his neck. He entertains people by putting snake in his neck. “It is a wild animal and even store-bought captive bred animals are still wild. It needs handled carefully even after it has become tame and carelessness can make it lapse back into it’s natural ways. I make snake comfortable otherwise it will be unhappy and unhappy snake is not tame snake and it can attack anytime,” he said while talking to INFN. He said that no matter how much he tries at it, the snake will never become like a dog or a cat that comes when beckoned by the master because of its instinct. He has kept lots of snakes and knows how to handle them but still he fears snakes as well, he added. Poverty has forced men to resort to adopting dangerous and unique professions to get the ‘fire of hunger’ extinguished in this age of price-hike and the ‘hard-times’ we are going through.